If you are interested in the use of the voice for sound healing, you may want to watch a video of Tibetan lama Tenzin Wangyal Rimpoche giving a teaching. You can find some on YouTube by searching for "Tenzin Wangyal" or "Ligmincha". If you have listened attentively to recordings or performances of harmonic toning or chanting, you may recognize the edge of harmonics in Rimpoche's intoning of the various seed syllables and mantras connected with the teachings. In India and Tibet, mantras are considered to have great power if correctly intoned. The belief in the power of certain words and phrases when properly sung/spoken was once probably worldwide, and it is still alive in many cultures. If you are open to the fact that many religions have great healing wisdom, and we can learn from all of them if we approach them with openness and respect, participating in a Tibetan ceremony, even on line, can be a great learning experience on the use of sound for healing. Today I watched a live teaching and ceremony in which Rimpoche taught and led the practice of the Bon deity Sherab Chamma (shown in the painting above). Her name means Wisdom Loving Mother. The practice uses a mantra, breathing, and visualizations to heal the body, mind and spirit. Tenzin Wangyal is an authority on the practices of the Tibetan Bon religion, of which he is a renowned teacher. He is the author of several books of teachings and the founder of the Ligmincha Institute. In December of 2007, I reviewed his book and CD on Tibetan Sound Healing. 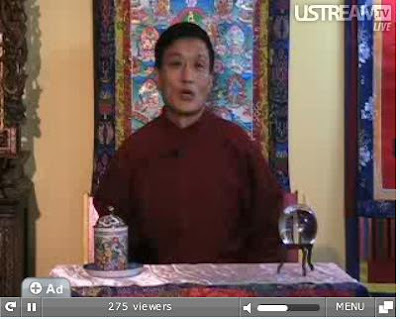 Today's webcast was the first of a series of live teachings Tenzin Wangyal will be giving over the Internet. To receive notice of them as they are scheduled (so that you can participate live, ask questions, etc. ), sign up for a free subscription to the Voice of Clear Light newsletter. 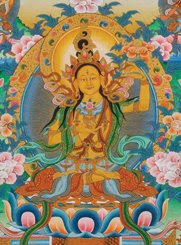 For more information on Sherab Chamma, the Wisdom Loving Mother, go to this page at Ligmincha online store. I feel blessed to have participated in this event.